Richard Marsh (1857-1915) is chiefly remembered for his horror novel The Beetle (1897) and for his supernatural fiction, but he was in fact a hugely prolific author, publishing as many as eight books in a year at the height of his popularity and proving himself adept not only as a writer of horror but also an accomplished author of short stories and comic fiction. 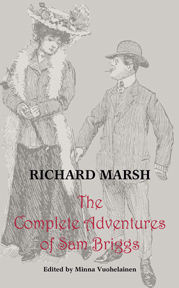 In the lower-middle-class clerk Sam Briggs, whose adventures first appeared in Strand Magazine alongside the more famous Sherlock Holmes stories, Marsh created one of his most endearing and enduring characters. The first eleven tales in this collection, originally published between 1904 and 1914, relate the hilarious adventures and misadventures of young Sam as he finds himself in a series of increasingly awkward situations. The final twelve stories, published in 1915 while Marsh's own sons were serving in the army, thrust Sam into the First World War as he enlists in the British Army, fights the Germans in Belgium, and goes on to become a war hero. This collection includes all twenty-three Sam Briggs stories and is the first republication of any of these tales since 1916. Featuring a new introduction and extensive notes by Minna Vuohelainen as well as a number of the original illustrations from Strand Magazine, this edition will be welcomed by those who have enjoyed Marsh's other fiction or who are interested in literature of the Edwardian era and the First World War.